With customers demanding more personalized service and greater convenience, increasing loyalty, timely advice and issue resolution with secure and flexible on-demand collaboration and onboarding tools is of utmost importance to financial services organizations. Moving effortlessly between messaging, content collaboration, screen sharing, white boarding, and real-time meetings enables important documents to be completed and signed from any device, at any time. By enabling customers, young and old, to more easily engage with customer service representatives on their own time, at their own pace, and through their own channels, organizations can provide a seamless digital collaboration and customer onboarding process that will reduce the friction experienced through existing methods. 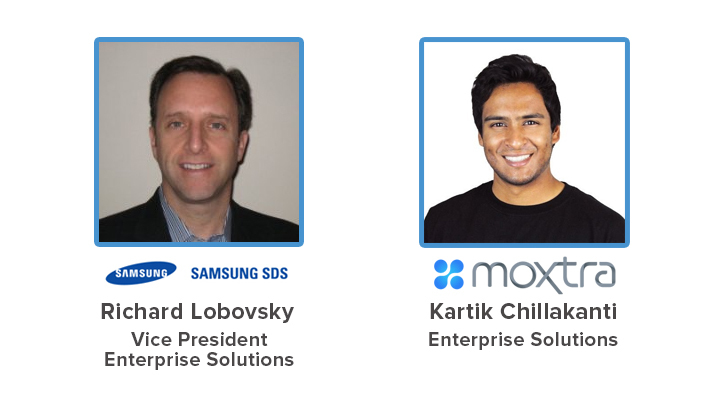 Samsung SDSA and Moxtra invite you to join us for an educational webinar on May 23rd at 2pm ET that covers streamlining and digitalizing customer onboarding and collaboration, improving customer service and extending support across multiple mediums, and maintaining MiFID II & KYC (know your customer) compliance.